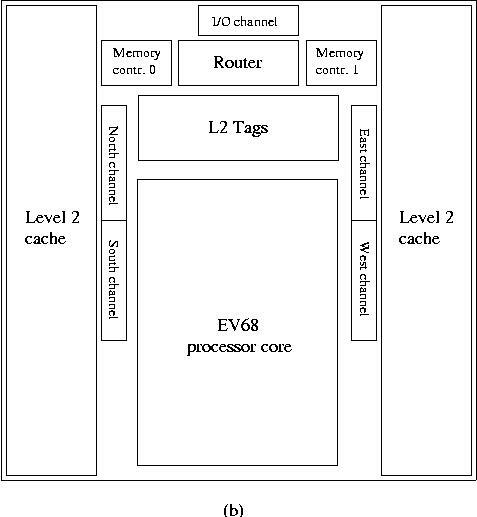 Figure 8a: Block diagram showing the functional units in an Alpha EV7 processor. A notable fact is that there are two duplicate integer register files both with 80 entries, that each service a set of integer functional units called cluster 0 and cluster 1, respectively, by Compaq. The four integer Add/Logical units can exchange values in one cycle if required. Although this is not shown in the diagram, the integer multiply is fully pipelined. 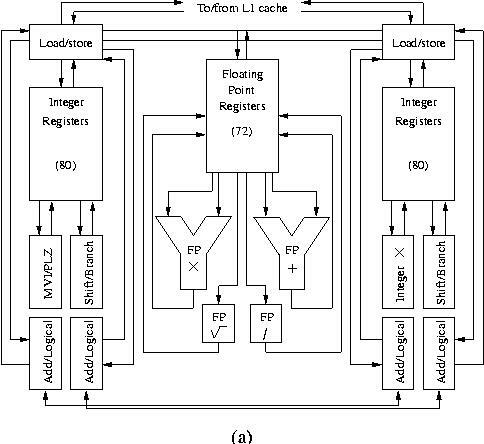 The two integer clusters and the two floating-point units enable the issuing of up to 6 instructions simultaneously. The two load/store units draw on a 64 KB instruction and a 64 KB data cache that are both 2-way set-associative. Four instructions can be accepted for (speculative) processing. Of the 80 integer and 72 floating-point registers 41 in both register files can hold speculative results. The out-of-order issuing of instructions is supported via an integer queue of length 20 and a floating-point queue with 15 entries. However, as the integer processing clusters do not contain the same functional units, the issuing of integer instructions cannot all be scheduled dynamically. Those instructions that need to execute in a particular unit (e.g., an integer multiply that is only available in cluster 0) are scheduled statically. As soon as an instruction is issued or is terminated due to mis-speculation it is removed from the queue and can be replaced by another instruction. Instruction fetching is governed by the branch predictor. This hardware contains global and local prediction tables and Branch History Tables (BHTs) to train the predictor in order to obtain an optimal instruction fetch to the instruction cache and registers. Figure 8b: Chip layout for the Alpha EV7 processor. The path to memory is implemented by 4×5 RAMBUS links as the systems will be fitted with RAMBUS memory yielding a bandwidth of 6 GB/s, so 12 GB/s in total. The direct I/O dual link from the chip also has a bandwidth of 1.6 GB/s. The fastest EV79 implementation is shipped at a clock frequency of 1.3 GHz and is expected to still rise slightly in later implementations.